Refueling ships with oil in a low-tax area. Conservationism, ecology, workers and oil industry on a common ring. Field of Gibraltar is one of the most industrialized areas of Spain. During Franco’s dictatorship, an industrial development plan was approved in 1969, which meant a major change in the ordinary life of Cadiz. Some people thought this change was profitable because of two reasons: economic growth and development of the area. On the opposite side, other people were questioning the supposed benefits of industrial development, arguing that it had been already affecting local ecosystems and taking over the political control of the Bay. Protests were heard soon even among the workers. One of the main concerns, which appeared on all newspapers, was the Bunkering. This practice is meant for transferring fuel from one ship to another and the whole process takes place in the sea. One ships acts as a “gas station” while another ship receives its fuel. This practice has become very popular in this area (Gibraltar) because of the low costs that taxed this activity. And that is why thousands of liters of oil are dumped uncontrollably in the sea, leaving a large bulk of oil, and guilty industries that cause this pollution remains unpunished. Environmentalists, ecologists and many organizations for environmental rights focus their efforts to eradicate this practice in Gibraltar and in the rest of the world. On the other hand, most workers, affected or no, have also mobilized several times in order to put solution to high pollution levels, joining protests with fishermen and other workers in the same area. The spokesman of the socio-cultural association of Spanish workers Gibraltar (Ascteg), Juan Jose Uceda, has been one of the main leader of labor protests. Today, unfortunately, this practice continues in the Gibraltar area. 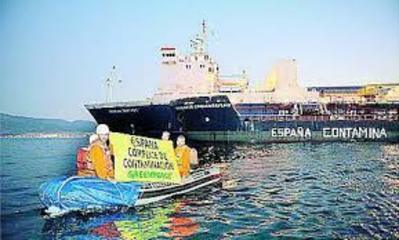 Spanish government decided to toughen up sanctions against ships that are not considered appropriate for this practice. A representative for “Ecologistas en acción”, Antonio Muñoz has appealed to the protection of the area through Article 11 of the statement of Special Area of Conservation (SAC), which expressly prohibits the transfer of fuel from a ship to another one. On this point, Antonio Muñoz explains that SAC is an environmental protection of Eastern Strait, which "overrides the Site of Community Interest" that Gibraltar had previously wielded. Development of Alternatives Proposals are being made by Greenpeace is the cessation of the activity completely. In addition to legally combat this activity, the minister Arias Cañete has appealed to the environmental protection of the area through Article 11 of the declaration of Special Area of ​​Conservation (SAC ) , which expressly prohibits the transfer of oil from ship to ship . Why? Explain briefly. Nowadays, Bunkering is still being practised. Thousands of discharges fall into the sea and the current regulatory law is not sufficient. 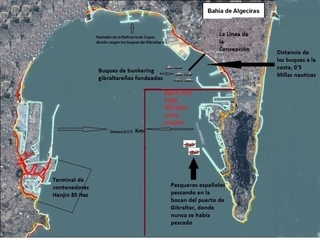 The coastal areas of Gibraltar are in danger and the locals suffering the consequences. Other Comments En aguas de la Bahía de Algeciras hay cuatro compañías de bunkering con base en Gibraltar: Vemaoil (que vende el 38,5 % del total), con gasolineras flotantes como el "Vemaspirit"; Cepsa (que vende el 30,82 % del total); Aegean Bunkering (el 27,14 %), con gasolineras flotantes como el "Aeolos"; y Bunkers (que vende el 3,49 %), con gasolineras flotantes como el "Jacques Jacob".